I wouldn’t count myself as an activist. I don’t march round with signs or knock on the door of city hall but as I get more into what goes into the food on our table I wonder if I shouldn’t be finding a way to speak up. It perplexes me the lack of concern many have when it comes to what goes into their bodies. Mind you, I’m not perfect. You won’t see me giving up the Cadbury Creme Eggs ever. The real ones, not the ones Hershey makes under license. But overall I want the scales tipped in my favour in terms of how much good stuff we should consume. There have been some interesting things coming out in the news lately as there is a gradual growing demand to know what is in the food. Kashi got it’s wrist slapped because they were using GMOs. So much for all natural. They pledge to change. Our co-op had a sign stating they were trying to resource some organic veg away from Cascadia Farms as they were sourcing from China. If you look closely at their package they talk about their “home farm” being in the US. This bothers me. I try very hard to buy my food that was grown and produced in the US as I live here. And if I buy imports I want to know where they came from. The big thing we try to do is buy locally as round here there aren’t many, if any, industrial farms for meat or produce. We get to know the farmers. I’m currently reading “Blessing the Hands That Feed Us” by Vicki Robin. She did a month long experiment where she only ate what she could get within a 10 mile radius. If it was produced beyond that then it was off limits. It’s definitely food for thought. We actually do pretty well in this department. I think, particularly in the warmer months, the majority of our food is local. The dilemma I face with shopping locally is the balance of organic vs nonorganic. Is it better to buy organic that has been trucked in or local produce that has been sprayed? We have a fabulous berry farm but they aren’t organic. I know they try to do low impact spraying but still. I think at the end of the day for us I’d prefer organic. Won’t be GMO if it is organic. But I do love our network of farms here. It’s fabulous. This meal that I prepared can actually be all local with the exception of two ingredients, brown rice and cinnamon. Which isn’t too bad. We can get local apricots here though it is an extremely short season. I made this with lamb for Easter but the pictures were horrid. Must have been rushing round that day. So I decided to make the sauce again but with chicken and brown rice. Ginger can even be a local ingredient. I need to research how to grow it in our area. Which would be good as this ginger is from Hawaii. It took a longer trip than my Creme Eggs. Cut and peel about an inch square and set aside for grating later. 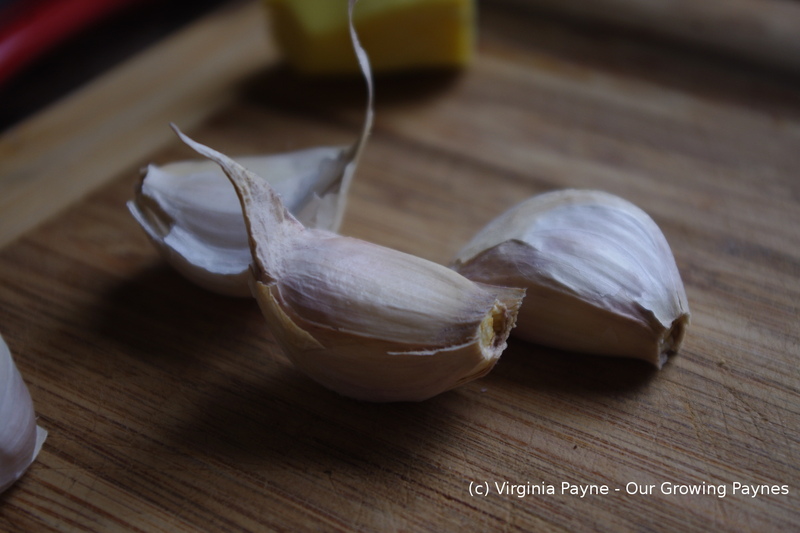 Mince 4 cloves of garlic and finely chop about 1/2 a cup of red onion. 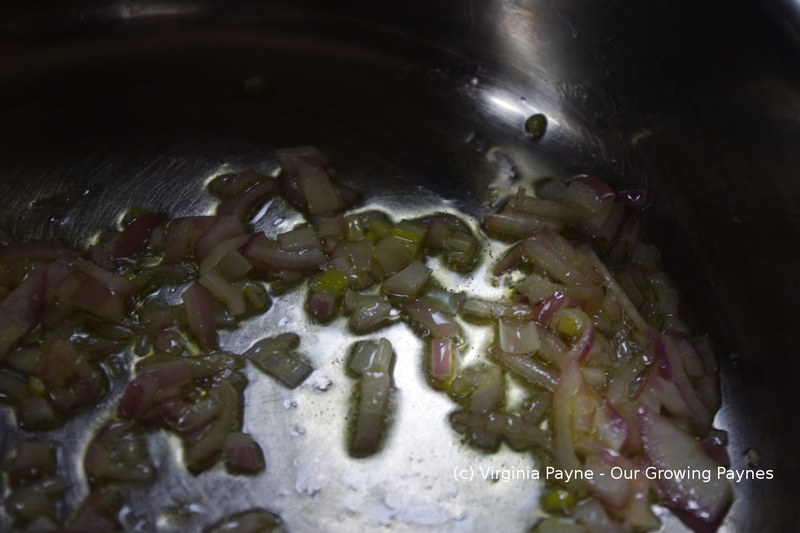 Saute the onion in olive oil for a few minutes until it is softened. We used chicken thighs for this and I cut them into cubes. 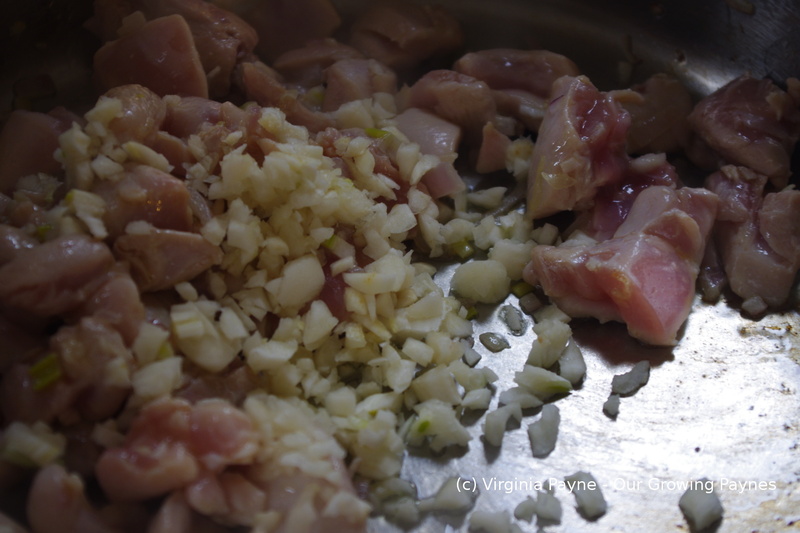 Start browning the chicken, when they are halfway cooked add the garlic. Instead of using chicken stock like I normally would with chicken I used veg bouillon to give this dish a bit of depth. I used about a cup. Bring it up to a simmer and start grating the ginger. 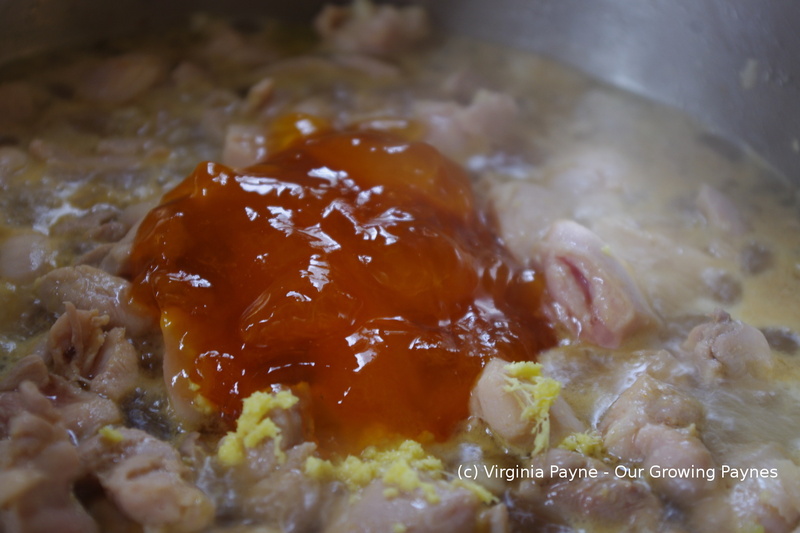 Add between a 1/3 and a 1/2 a cup of apricot jam, preferably no sugar added or it will be very sweet. Mix well and add a dash or two of cinnamon. Cook until the chicken is done then serve over the brown rice. 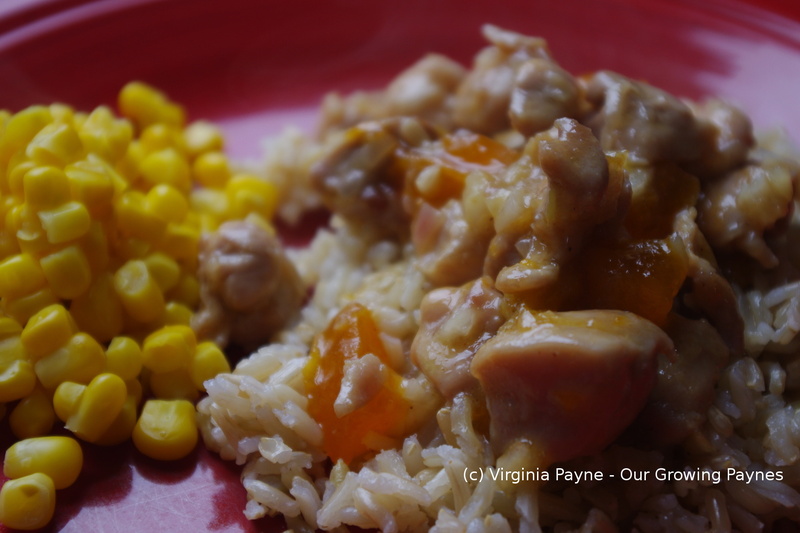 This entry was posted in recipes and tagged apricot, apricot jam, chicken, cinnamon, cloves of garlic, cooking, dinner, food, garlic, ginger, Onions. Bookmark the permalink. I’m interested to read the book you mentioned. I’ve been learning a lot myself about where our food comes from, and, for that matter, what actually constitutes real food. One of the best books I’ve read so far on this topic is “In Defense of Food” by Michael Pollen. 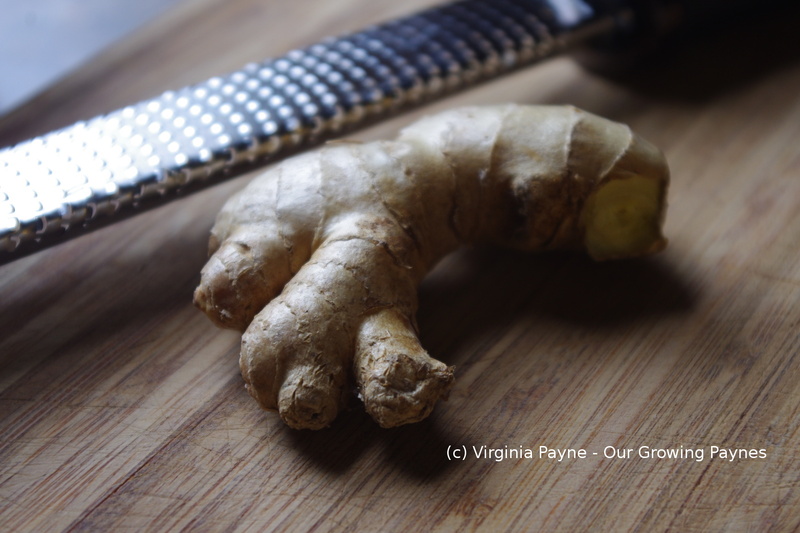 Thanks for the delicious-looking recipe– fresh ginger is one of my go-to ingredients! I’ll have to look for the book by Michael Pollen. It is sad we live in an era where people are starving themselves by eating junk. Thank you! They certainly came out better than the first ones. Oh boy.